by Mathieu Bélanger-Barrette and Robotiq Inc.
We often see robotic or automated cells purposed to do a single motion or a very specific application. However, with all the new technology available in the market, it is interesting to see how each separate technology can be integrated into a single versatile cell. This is what Sirris did and it is quite impressive. Sirris is a collective center for the technology industry in Belgium and has more than 8 sites throughout the country. Their goal is to help companies keep up with the evolution of technology, particularly with regards to automation. In fact, with a huge team of engineers, technicians and scientists, Sirris is using its laboratories, innovation centers and show rooms to develop, test and demonstrate the different applications they help develop for specific customers. Lately they have been promoting their new (8th) location by showcasing an example of what an Industry 4.0 robotic cell might look like. This cell uses a bunch of new technology and it’s very impressive. The proposed cell highlights some of the concerns manufacturers have been having over the past 2-3 years about where automation was going next. I think we have our answer here! See the video below to learn more. 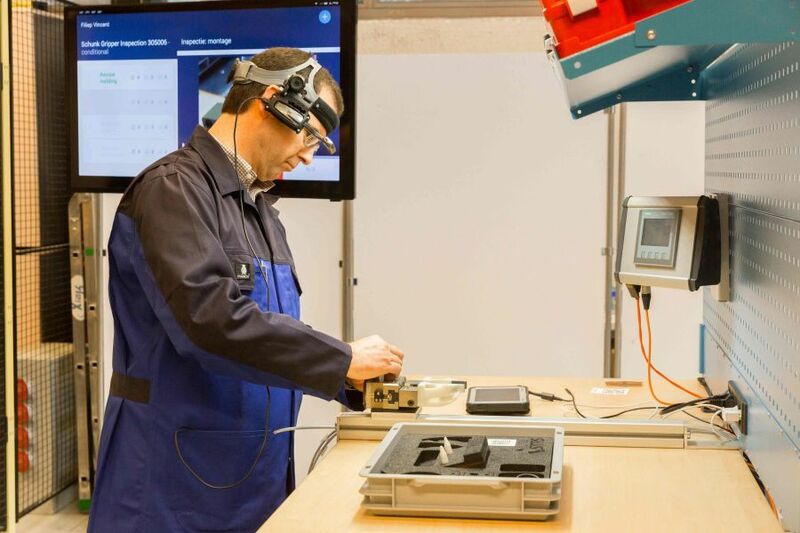 Ordered Picking: Using smart glasses and a smart watch, the user can pick (and place) the required parts in a bin. Using these devices allows the operator to verify if the right number of parts are preloaded in the tray, that the assembly line has the right number of parts during the assembly process and to do this verification of inventory in real time. Transition No. 1: As the tray is set on a mobile robot or AGV (automated guided vehicle), the operator simply signals that the tray has been loaded and that the robot can move to the next step in the process. Through different guiding sensors, the mobile robot can make its way to the next cell (imagine the other cell could be on the other side of the plant) and be ready for the next step. Assembly Cell: As the trays are filed with parts, the operator and the collaborative robots are building the assembly together. In fact, since the robot is really good at pick and place and the human is very good at manipulation, they split tasks to make the job easier and faster. Once the part is assembled, the robot places the tray on the mobile robot. It can then go to the quality testing station. Notice that the robot used is a KUKA LBR iiwa with a Robotiq 2-Finger 140 Adaptive Gripper. You also see a Universal Robots UR3 used to screw different components together. Transition No. 2: Once again, the final step is getting to the last quality check. Notice that sensors are used to navigate within the room and that mechanical devices are installed on both the mobile robot and the table to make the mobile robot’s position repeatable. Quality Check: With the help of different types of technology (software and vision systems), the company can do the final quality check. This will confirm that the product meets the requirements established by the company. For more pictures of the showroom, follow this link. In this way, the new lab makes the cooperation and interaction between human operator and robots more tangible and feasible to the manufacturing industry. The focus on flexible automation of assembling makes specific technology applications available to machine building and mechatronics companies. After all, to many companies automation and robotics in particular still seem way out of reach, too futuristic for their production. Until they see the possibilities “in real life”. In fact with few examples of real life applications of complex automation, customers and even integrators sometimes have difficulty figuring out how they can automate certain processes. With technology reaching new levels at a fast rate, it is cool to see the final results of an automation cell, which might be complex for the integrator, but is totally transparent and easy to use for the end user. This is truly an example of Industry 4.0 happening now.